Becoming a sole trader is one of the most popular choices for setting up a business – it’s easy to do, you have full control over all decisions and you retain all the profits. Despite the obvious advantages, it also means that you’re the only one liable when things go wrong. For this reason, you need to make sure you’re covered by public liability insurance. Let’s take a closer look at what you need to know about this form of cover. Public liability insurance is designed to protect you financially if you cause damage to property or injury to a person due to your actions at work. If you’re found liable following a successful claim, you could be required to pay thousands (or hundreds of thousands!) of dollars to cover costs such as repairs, replacements, medical bills and rehabilitation costs. With public liability insurance, these costs are covered by the insurer. Liability insurance will also cover legal bills if you need to hire a lawyer. Why do sole traders need liability cover? As a sole trader, public liability insurance is essential. No matter how careful you are, you can easily find yourself at the receiving end of a liability claim. All it could take it for a third party to trip on your work premises or for you to damage property on site for you to find yourself responsible for some serious costs. 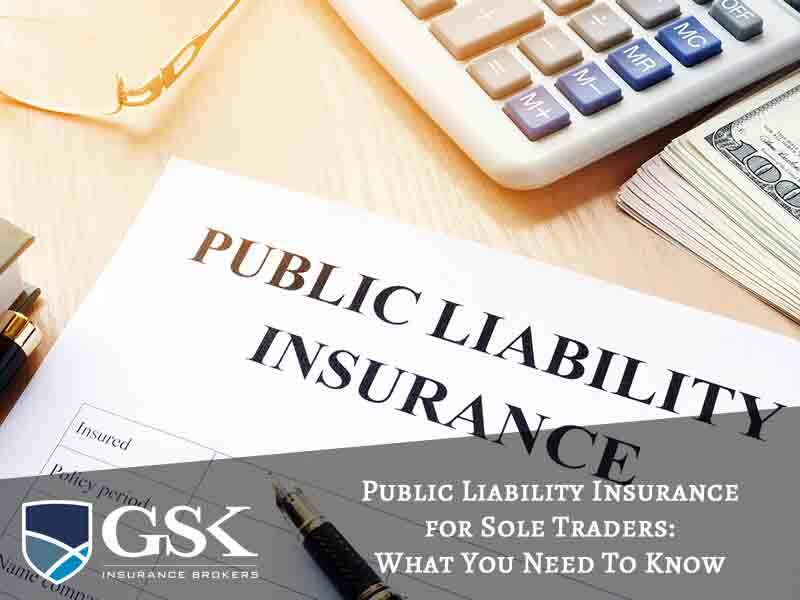 For a lot of sole traders, a liability claim could be financially crippling and public liability insurance offers you peace of mind that you’re protected financially in the event of third party suffering a loss or injury. A lot of sole traders ask if their public liability insurance is compulsory. The answer is no, it’s not a legal requirement. However, a lot of clients require proof of liability cover before they’ll use your service and it’s often a requirement of any employment contract. Also, there are some trades where you won’t be able to obtain your licence without liability cover. What other forms of cover should I have? Although public liability insurance is an essential form of cover for sole traders, there are a number of other policies you should consider to complete your insurance package. At GSK Insurance Brokers, we provide customised insurance solutions for our customers. We offer public liability insurance Australia, along with a range of other policies which cover your areas of risk. For a public liability insurance quote, have a chat to one of our brokers or fill in our easy trades quote calculator online. If you need public liability insurance, speak to the insurance experts at GSK Insurance Brokers today on (08) 9478 1933.